As recent breaches like Target and Neiman Marcus show, payment card information is involved in more security breaches than any other data type. In too many places, sensitive card data is simply not protected adequately. Hacking Point of Sale is a compelling book that tackles this enormous problem head-on. Exploring all aspects of the problem in detail - from how attacks are structured to the structure of magnetic strips to point-to-point encryption, and more – it's packed with practical recommendations. This terrific resource goes beyond standard PCI compliance guides to offer real solutions on how to achieve better security at the point of sale. 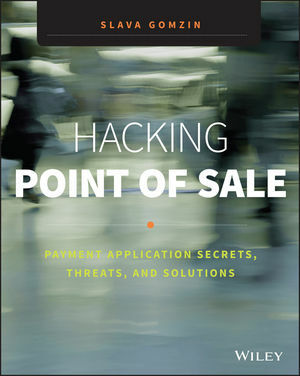 Hacking Point of Sale: Payment Application Secrets, Threats, and Solutions is essential reading for security providers, software architects, consultants, and other professionals charged with addressing this serious problem. Slava Gomzin, CISSP, PCIP, ECSP, Security+ is the Security and Payments Technologist at Hewlett-Packard. Prior to joining HP, Slava was a security architect and PCI ISA, corporate product security officer, and R&D and application security manager at Retalix, a Division of NCR Retail.